A state of emergency was declared in seven Russian regions yesterday, as authorities struggled to cope with forest fires which have been burning for a week. A total of 34 people have died and thousands have been left homeless by the blazes, which have been prompted by one of the most severe heatwaves to hit European Russia in recorded history. President Dmitry Medvedev referred to the fires as a “huge tragedy” yesterday, and said the state would do everything it could to help those affected. The army has been called in to help tackle the fires, which are expected to continue raging as temperatures show no sign of dropping. The state of emergency means that people will be banned from entering areas deemed at high risk for new fires. Many of the blazes have been sparked by discarded cigarette ends or barbecues. Mr Medvedev appealed to Russians to be extra vigilant. In some regions of European Russia, whole villages have been burned to the ground by the fires. Late last week, Vladimir Putin, the Prime Minister, travelled to Verkhnyaya Vereya, where 337 of the village’s 341 houses have been destroyed. He spent time reassuring distraught residents, and promising that houses would be fully rebuilt before winter sets in. 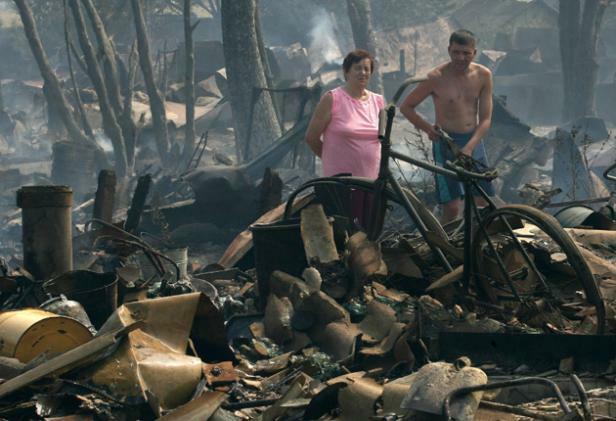 In some areas there have been complaints that local officials were too slow to respond to the fires, and many residents of Verkhnyaya Vereya told Mr Putin that their calls to emergency services went unanswered. The Prime Minister told officials that they would have to work weekends until the fires were under control. “Neither fire nor wind have days off, so we can’t take any days off either,” said Mr Putin. The promise of new housing and compensation for victims of the fires has led to a whole host of rumours that some Russians are burning down their own houses. A caller to a Russian radio station yesterday morning from the Vladimir Region claimed that neighbours in his village had decided to set fire to their houses after hearing that a German company would be building replacement homes for victims. Mr Putin said that all compensation claims would be thoroughly checked. Aside from the fires, the high temperatures across Russia are causing other problems. Few buildings have air conditioning and shops have sold out of fans. Dozens of Russians seeking refuge from the heat in ponds and lakes drown each day, many of them reportedly drunk. Temperatures in Moscow have repeatedly broken records during the past month, with the hottest temperature in recorded history achieved last week. The record is expected to be broken again this week, with temperatures of up to 40 degrees forecast for Friday. Peat bog fires on the outskirts of the city have also meant that on several days the capital has been shrouded in acrid smog.